The Ingredients of Chile’s 1973 Military Coup .Michel Chossudovsky ,Professor of Economics at the Catholic University of Chile. The military coup was supported by the CIA. Secretary of State Henry Kissinger played a direct role in the military plot. Forty years ago on September 11, 1973, the Chilean military led by General Augusto Pinochet, crushed the democratically elected Unidad Popular government of Salvador Allende. The objective was to replace a progressive, democratically elected government by a brutal military dictatorship. In the weeks leading up the coup, US Ambassador Nathaniel Davis and members of the CIA held meetings with Chile’s top military brass together with the leaders of the National Party and the ultra-right nationalist front Patria y Libertad. While the undercover role the Nixon administration is amply documented, what is rarely mentioned in media reports is the fact that the military coup was also supported by a sector of the Christian Democratic Party. Patricio Aylwin, who became Chile’s president in 1989, became head of the DC party in the months leading up to the September 1973 military coup (March through September 1973). Aylwin was largely instrumental in the break down of the “Dialogue” between the Unidad Popular government and the Christian Democrats. His predecessor Renan Fuentealba, who represented the moderate wing of the Christian Democratic (PDC), was firmly against military intervention. Fuentealba favored a dialogue with Allende (la salida democratica). He was displaced from the leadership of the Party in May 1973 in favor of Patricio Aylwin. This motion was adopted almost unanimously by the opposition parties, including the DC, the Partido Nacional and the PIR ( Radical Left). The leadership of the Christian Democratic Party including former Chilean president Eduardo Frei, had given a green light to the Military. And continuity in the “Chilean Model” heralded as an “economic success story” was ensured when, 16 years later, Patricio Aylwin was elected president of Chile in the so-called transition to democracy in 1989. At the time of the September 11 coup, I was Visiting Professor of Economics at the Catholic University of Chile. In the hours following the bombing of the Presidential Palace of La Moneda, the new military rulers imposed a 72-hour curfew. When the university reopened several days later, I started patching together the history of the coup from written notes. I had lived through the tragic events of September 11, 1973 as well as the failed June 29, 1973 coup. Several of my students at the Universidad Catolica had been arrested by the military Junta. In the days following the military takeover, I started going through piles of documents and newspaper clippings, which I had collected on a daily basis since my arrival in Chile in early 1973. Some of this material, however, was lost and destroyed in the days following the coup. This unpublished article was written [forty] years ago. It was drafted on an old typewriter in the weeks following September 11, 1973. This original draft article plus two carbon copies were circulated among a few close friends and colleagues at the Catholic University. It was never published. For 30 years it lay in a box of documents at the bottom of a filing cabinet. I have transcribed the text from the yellowed carbon copy draft [in 2003]. Apart from minor editing, I have made no changes to the original article. The history of this period has since then been amply documented including the role of the Nixon administration and of Secretary of State Henry Kissinger in the plot to assassinate Allende and install a military regime. The main objective of the US-supported military coup in Chile was ultimately to impose the neoliberal economic agenda. The latter, in the case of Chile, was not imposed by external creditors under the guidance of IMF. “Regime change” was enforced through a covert military intelligence operation, which laid the groundwork for the military coup. Sweeping macro-economic reforms (including privatization, price liberalization and the freeze of wages) were implemented in early October 1973. While food prices had skyrocketed, wages had been frozen to ensure “economic stability and stave off inflationary pressures.” From one day to the next, an entire country had been precipitated into abysmal poverty; in less than a year the price of bread in Chile increased thirty-six fold (3700%). Eighty-five percent of the Chilean population had been driven below the poverty line. I completed my work on the “unpublished paper’ entitled “The Ingredients of a Military Coup” (see text below) in late September. In October and November, following the dramatic hikes in the price of food, I drafted in Spanish an initial “technical” assessment of the Junta’s deadly macro-economic reforms entitled “La Medición del Ingreso Minimo de Subsistencia y la Politica de Ingresos para 1974′ (The). Fearing censorship, I limited my analysis to the collapse of living standards in the wake of the Junta’s reforms, resulting from the price hikes of food and fuel, without making any kind of political analysis. The Economics Institute of the Catholic University was initially reluctant to publish the report. They sent it to the Military Junta for its approval prior to its release. I left Chile for Peru in December. The report was released as a working paper (200 copies) by the Catholic University a few days after my departure. In Peru, where I joined the Economics Department of the Catholic University of Peru, I was able to write up a more detailed study of the Junta’s neoliberal reforms and its ideological underpinnings. This study was was published in 1975 in English and Spanish. Needless to say, the events of September 11 1973 also marked me profoundly in my work as an economist. Through the tampering of prices, wages and interest rates, people’s lives had been destroyed; an entire national economy had been destabilized. Macro-economic reform was neither “neutral” –as claimed by the academic mainstream– nor separate from the broader process of social and political transformation. Two years later, I returned to Latin America as a visiting professor at the National University of Cordoba in the northern industrial heartland of Argentina. My stay coincided with the 1976 military coup d’État. Tens of thousands of people were arrested; the “Desaparecidos” were assassinated. The military takeover in Argentina was “a carbon copy” of the CIA-led coup in Chile. And behind the massacres and human rights violations, “free market” reforms had also been prescribed, this time under the supervision of Argentina’s New York creditors. The IMF’s deadly economic prescriptions under the “structural adjustment program” had not yet been officially launched. The experience of Chile and Argentina under the “Chicago boys” was “a dress rehearsal” of things to come. In due course, the economic bullets of the free market system were hitting country after country. Since the onslaught of the debt crisis of the 1980s, the same IMF economic medicine has routinely been applied in more than 150 developing countries. From my earlier work in Chile, Argentina and Peru, I started to investigate the global impacts of these reforms. Relentlessly feeding on poverty and economic dislocation, a New World Order was taking shape. 3. See http://www.fjguzman.cl/interiores/noticias/tema_se/2003/julio/Patricio%20Aylwin%20y%20la%20dictadura%20transitoria.pdf , See also: El acuerdo que anticipó el golpe, http://www.quepasa.cl/revista/2003/08/22/t-22.08.QP.NAC.ACUERDO.html . The transition to a right-wing military regime in Chile on September 11  has resulted after a lengthy and drawn-out process of economic boycott, subversion within the Armed Forces and political opposition to Allende’s Popular unity government. In October 1970, General René Schneider was assassinated in a plot of the ultra-right together with seditious elements of the Armed Forces led by General Roberto Viaux. The assassination of General Schneider was part of a coordinated plan to prevent Parliament from ratifying Allende’s victory in the September 1970 presidential elections. Last year’s  October strike which paralyzed the economy for over a month, was organized by the gremios (employers’ organizations together with opposition labor and self employed organizations), the Partido Nacional and the ultra-right nationalist front Patria y Libertad. Some sectors of the Christian Democratic Party were also involved. The October Strike had initially been planned for September 1972. “Plan Septiembre” was apparently postponed due to the sudden dismissal of General Alfredo Canales from the Armed Forces. Canales together with Air Force General Herrera Latoja had earlier been in touch with Miguel Ubilla Torrealba of the nationalist front Patria y Libertad. Ubilla Torrealba was said to have been closely connected to the CIA. Despite General Canales premature retirement from the Armed Forces, Plan Septiembre was implemented in October beginning with a transport strike. The Right was hoping that those elements of the Armed forces, which had been inspired by General Canales would intervene against Allende. The October “Patronal” strike (employers and self-employed) failed due to the support of the Armed Forces headed by General Carlos Prats, who had integrated Allende’s cabinet as Minister of the Interior. On June 29, 1973, Coronal Roberto Souper led his tank division in an isolated attack on La Moneda, the Presidential Palace, in the hope that other units of the armed forces would join in. The June coup had initially been planned for the morning of September 27 by Patria y Libertad as well as by several high ranking military officers. The plans were found out by Military Intelligence and the coup was called off at 6pm on the 26th. A warrant for the arrest of Coronal Souper had been issued. Confronted with knowledge of his impending arrest, Colonel Souper in consultation with the officers under his command, decided to act in a most improvised fashion. At 9 am, amidst morning rush hour traffic, Tank Division Number Two drove down Bernardo O’Higgins, Santiago’s main down-town avenue towards the Presidential Palace. 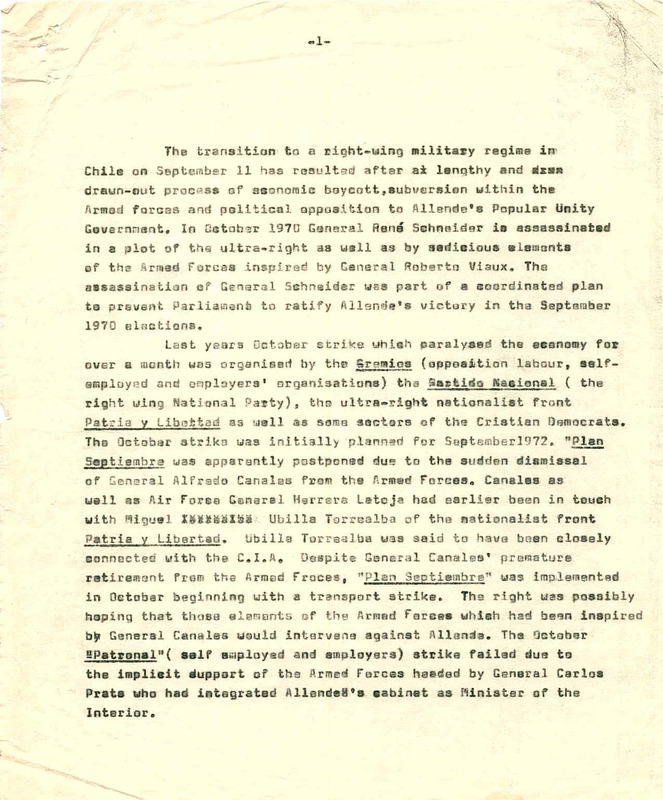 While the aborted June Coup had the appearance of an insolated and uncoordinated initiative, there was evidence of considerable support in various sectors of the Navy as well as from Air Force General Gustovo Leigh, now [September 1973] member of the military junta [on 11 September General Leigh integrated the military Junta headed by General Pinochet]. According to well-informed sources, several high ranking officers in the aero-naval base of Quintero near Valparaiso had proposed the bombing of State enterprises controlled by militant left wing groups, as well as the setting up of an air corridor to transport navy troops. The latter were slated to join up with the forces of Colonel Souper in Santiago. The June trial coup was «useful» indicating to the seditious elements within the Chilean Armed Forces that an isolated and uncoordinated effort would fail. After June 29, the right-wing elements in the Navy and the Air Force were involved in a process of consolidation aimed at gaining political support among officers and sub-officers. The Army, however, was still under the control of Commander in Chief General Carols Prats, who had previously integrated Allende’s cabinet and who was a firm supporter of constitutional government. Meanwhile in the political arena, the Christian Democrats were pressuring Allende to bring in members of the Military into the Cabinet as well as significantly revise the programme and platform of the Unidad Popular. Party leaders of the government coalition considered this alternative [proposed by the Christian democrats] as a « legalized military coup» (golpe legal) and advised Allende to turn it down. Carlos Altamirano, leader of the Socialist Party had demanded that an endorsement of the programme of the Popular Unity coalition by the military be a sina qua non condition for their entry into the Cabinet. Upon the impossibility of bringing in the Military into the Cabinet on acceptable terms, Allende envisaged the formation of a so-called “Cabinet of Consolidation” composed of well known personalities. Fernando Castillo, rector of the Catholic University and a member of the Christian Democratic Party, Felipe Herrera, President of the Inter-|American Development Bank and other prominent personalities were approached but declined. Pressured by economic deadlock and the transport strike, inflation of more than 15 percent per month and mounting political opposition, Allende sought in the course of July  to resume the political dialogue with the Christian Democratic Party. After the March  parliamentary elections, Patricio Aylwin had replaced Renan Fuentealba [May 1973] as leader of the Christian Democratic Party (PDC). Fuentealba, who represented the progressive wing of the Christian Democratic (PDC), was known to be in favor of a rapprochement with Allende. In other words, this rightward shift and hardening of the Christian Democrats in relation to the Unidad Popular, contributed to reinforcing their tacit alliance with the ring wing National Party. This alliance was initially intended as an electoral pact in the March  parliamentary elections in which the Unidad Popular obtained 43 percent of the popular vote. “We must create popular power (poder popular) based on the industrial belts (cordones industriales)” . The cordones industriales were organized and politicized labor groups. Together with MAPU, MIR was in the process of developing the Grupos de Accion Urbana (Urban Action Groups), with the task of educating and preparing the masses for armed resistance in the case of a military coup. In August , the Armed forces initiated a series of violent search and arrests directed against the MIR and state enterprises integrated by the industrial belts (cordones industriales). These searches were conducted in accordance with the Fire Arms control Act, adopted by [the Chilean] Congress after the October [1992 employers] strike and which empowered the Armed Forces [bypassing the civilian police authorities] to implement (by Military Law) the control of fire arms. [The objective of this measure was to confiscate automatic weapons in the members of the industrial belts and curb armed resistance by civilians to a military coup]. Meanwhile, right-wing elements in the Navy and Air Force were involved in actively eliminating Allende supporters by a well organized operation of anti-government propaganda, purges and torture. On August 7 , the Navy announced that a “subversive left wing group” integrated by MIR had been found out. Meanwhile, according to reliable sources, a seditious plan of the Right with the intent to bring down Allende’s government, using the Navy to control the entry of supplies into the country, had been discovered. Sailors and officers [within the Navy], who knew about these plans, were tortured and beaten. [In August 1973], high ranking military officers and members of Patria y Libertad, met with Senator Bulnes Sanfuentes of the National Party. Admiral Merino now [September 1973] a member of the Junta participated in meetings with members of National Party, senators of the Christian Democratic Party and staff of the US embassy. In fact towards mid-August , In FACT, towards mid-August, a motion declaring US ambassador Nathaniel Davis as persona non grata was drafted by a parliamentary committee of the Unidad Popular. Furthermore, the Armed Forces were colluding with the Ultra-Right by setting up a so-called Base operacional de Fuerzas especiales (BOFE) (Operational Base of Special Forces). BOFE units were integrated by member of the nationalist front Patria y Libertad. BOFE units were paramilitary divisions receiving material and financial support from the Armed forces. They were intended to undertake subversive and terrorist activities, which the Armed Forces could not openly undertake. BOFE was responsible for the many bomb attacks on pipelines, bridges and electric installations in the months preceding the military coup of September 11 . On August 9, Allende reorganized his cabinet and brought in the three joint chiefs of staff, Carlos Prats (Army), Cesar Ruis Danyau (Air force) and Raul Montero (Navy) into a so-called “National Security Cabinet”. Allende was only intent upon resolving the Transport Strike, which was paralyzing the country’s economy, he was anxious to gain whatever support was left within the Armed Forces. With General Carlos Prats out of the way, the road was clear for a consolidated action by the Army, Navy and Air Force. Prats successor General Augusto Pinochet convened the Council of 24 generals in a secret meeting on August 28. The purpose and discussion of this meeting were not made public. In all likelihood, it was instrumental in the planning of the September 11 military coup. The reshuffle of Allende’s National Security Cabinet took place on the same day (28 August). It resulted after drawn out discussions with party leaders of the Unidad Popular coalition, and in particular with Socialist Party leader Carlos Altamirano. A few days later, the Presidential Palace was bombed and Allende was assassinated. The rebirth of Chile, and a new institutional framework had emerged. Capital Accumulation in Chile and Latin America”, Yale University Lecture Series on Post-Allende Chile, North South, Canadian Journal of Latin American Studies, vol. IV, vol. XIII, no. 23, 1978, also published in Economic and Political Weekly. “Hacia el Nuevo Modelo Economico Chileno, Inflación y Redistribución del Ingreso, 1973-1974″, Cuadernos de CISEPA, no. 19, Catholic University of Peru, 1974, Trimestre Economico, no. 166, 1975, 311-347. “The Neo-Liberal Model and the Mechanisms of Economic Repression: The Chilean Case”, Co-existence, vol. 12, no. 1, 1975, 34-57. Gonzalo Martner. Golpe 1973 Un trauma no superado, que se transmite además a las nuevas generaciones?